The Ennedi Plateau, located in the North-East of Chad, in the Ennedi Region, is a sandstone bulwark in the middle of the Sahara. It is assailed by the sands on all sides, that encroach the deep valleys of the Ennedi. Only the caravans manage to cross it and this makes the region an area subject to multiple influences. The plateau also has a rich collection of fauna, including examples of the Desert crocodile, that once existed throughout the Sahara at a time of more abundant rainfall (see Neolithic Subpluvial). A striking characteristic of this population of crocodiles is dwarfism developed due to their isolation, which make them unusual (other such remnant populations are or were found in Mauritania and Algeria). They survive in only a few pools in river canyons in the area, for example the Guelta d'Archei, and are threatened with extinction. The last lions in the Sahara also survived here, until they became extinct; the last lion was seen in 1940. 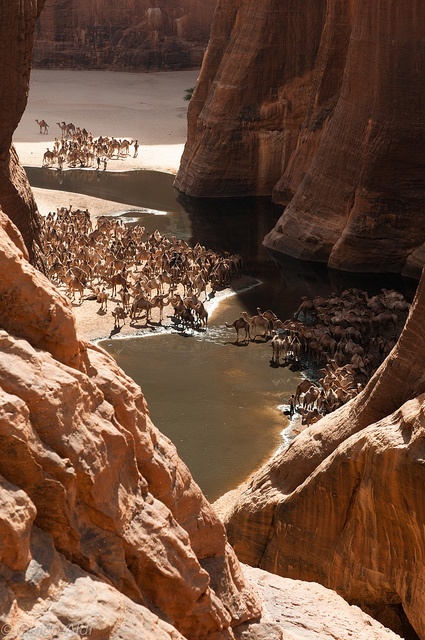 Also, any surviving Scimitar-horned Oryx antelopes that might still live in the wild are likely to be found in the remote regions of the Ennedi Plateau. It is also possible that the cryptid Ennedi tiger may still survive there.